You’ve been there – it’s 1:15 AM and you’re awake, jolted out of a doze-fest by the call of your stomach. Or you’re faced with making dinner for one or two – and the pile of take-out menus is looking very inviting. Then there are some days the standard family staples just don’t cut it – but since money is generally tight and diets are increasingly more complex, dialing in or going out is no longer a “get up and go” process. But cravings happen, and when they do Lucinda Scala Quinn is there to help slake them with her new book Mad Hungry Cravings: 173 Recipes for the Food You Want to Eat Right Now. Mad Hungry Cravings addresses both the “junkie” and the “virtuous” yearnings of the stomach, for all times of day and night. Broken down into four major sections (Break the Fast First, Anytime 24/7, What’s for Dinner?, Spirits & Sweets), there are chapters within each for the “traditional” parts of each meal (i.e. salads, sides). Colour photos of many dishes scatter the pages, which are pure heaven for the eyes and make your mouth water. If you weren’t craving Chicken Livornese (p. 176) before (or didn’t even know what it was), Jonathan Lovekin’s shots will spark one in short order. Scala Quinn also includes some of her own personal photography in black and white, adding to the bold graphic design of the book as well as adding a touch of heart to the printed word. The opening pages of Mad Hungry Cravings are packed with information and are a fantastic read for novice and seasoned cooks alike. The Mad Hungry Maxims (p. 5) are so true it hurts – shopping is half the job of cooking, don’t bite off more than you can chew, and above all... you’ve got to want to do it are take away points. I appreciated the chapter on expanding your repertoire and making cooking meals a learning experience. While the mother in Scala Quinn ties many of the points in Broaden Your Horizons (p. 9) to raising children, they are still fully valid for adults young and old. Finally, The Larder (p. 11) is both an entertaining and informative portion of the introduction which categorizes key ingredients and flavours for many of the common “restaurant” cuisines (American, Asian, Mediterranean and Latin) that readers will need to keep on hand if they plan on eating that type frequently. Some of the ingredients come with their own little tips to maximizing their potential, or what to look for when shopping (i.e. “pure”, not “imitation”, vanilla). Many recipes in Mad Hungry Cravings have an international lean due to the popularity of ethnic restaurants. Written by an American, there is a slight bias as to which dishes are considered “craveable” – some international readers may struggle with understanding the allure of Collard Greens with Ham and Bacon (p. 225) and Chicken-Fried Steak (p. 160), and since all the measurements are in imperial volume, it can present a chore to flip back and forth to the conversion chart at the back (although granted it is a very thorough one). Traditional “home cooked” recipes are also included of course, being some of the most commonly yearned-for dishes. A luscious Peach Pie (p. 278), Mac ‘n’ Cheese (p. 194) and chili-sauced Old-School Meat Loaf (p. 152) are just a handful of items that will transport diners back to after-school dinners and summer BBQ’s. Every recipe is approachable for most home cooks thanks to clear and thorough instructions, and while I wish there was a photo for every meal, I also appreciate that the book isn’t 5” thick thanks to full page pictures. Possibly my favourite part about the recipes in this book is the personal story Scala Quinn attaches to each of them. Whether it’s an anecdote regarding vacations surrounding Chicago Hot Dogs (p. 77) to how she started adding nutrition to her boys’ snacks with Banana Chocolate Chip Cookies (p. 285). Some of the introductions offer handy tips for storage or suggestions for serving as well. 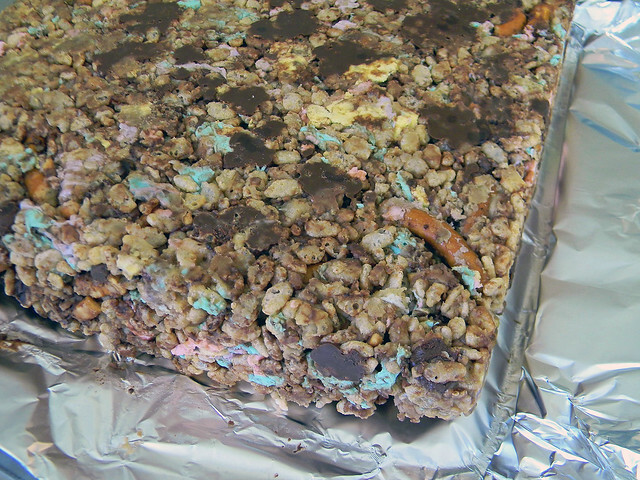 I sampled three recipes from Mad Hungry Cravings, each relatively simple to put together as written and yet gloriously accepting of interpretation. 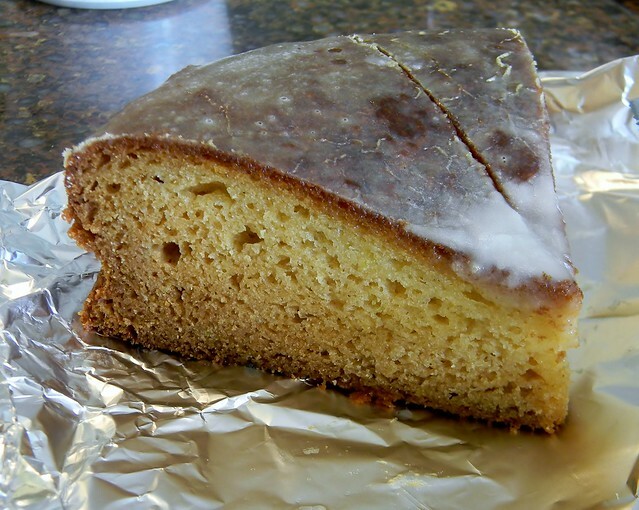 The first item I made was the Greek Yogurt Cake (p. 264), which was fantastically moist and tender, perfectly translating to my version: a Moist Lime Sour Cream Cake. 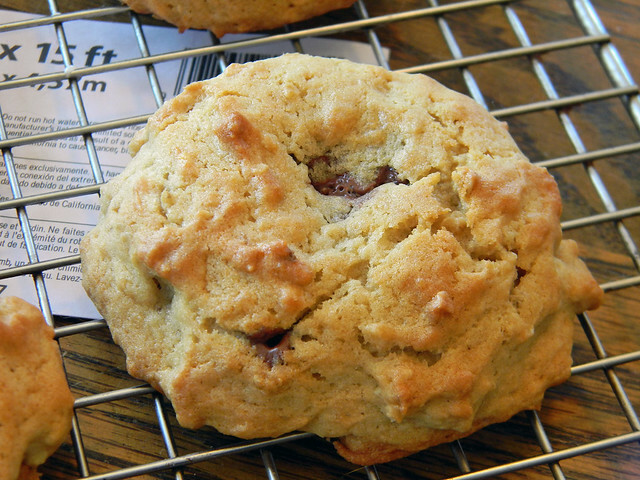 On a roll with the dessert side of things, I made the aforementioned Banana Chocolate Chip Cookies (p. 285) – stuffed with dark chocolate truffles rather than chocolate chips – and the absolutely sinful Dark-Chocolate Peanut Butter Pretzel Squares (p. 283). The only issue my taste testers had with the squares was that the peanut butter flavour overpowered the blend of ingredients rather than remaining a separate entity, and that the whole mixture was a little dense in texture (they suggested more marshmallows, which I definitely plan to try later on). Regardless, all three treats disappeared in short order, and I definitely plan to try some of the savouries (in particular the Chicken Tikka Masala (p. 171) and the Maple-Thyme Roasted Carrots (p. 230)). More recipes from the book appear in the Martha Stewart website’s “Sneak Peek at "Mad Hungry Cravings," Lucinda Scala Quinn's Newest Cookbook” slideshow. 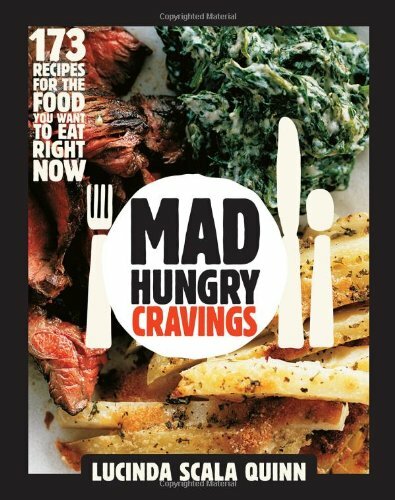 If you eat out (or take in) more often than not, you will find at least one winner in Mad Hungry Cravings: 173 Recipes for the Food You Want to Eat Right Now. With recipes as varied and delicious as the ones presented by Lucinda Scala Quinn, as long as you can clear the delivery menus off the stove, dust off a few pans and boil water, a fantastic meal or snack can be yours in the same amount of time as the pizza guy, for less money and hassle.